AKG K171 MKII Headphones combine the benefits of a closed-back design with the light weight and comfort of over-the-ear headphones. AKG K171s are an excellent choice for DJ and broadcast applications where no sound can bleed from the headphones into live microphones. The closed-back, rugged design gives K171 MKII headphones a different low-frequency character and maintains its comfort and flexibility. AKG K171 MKII headphones are ideal for studio tracking, as well as for DJ use. 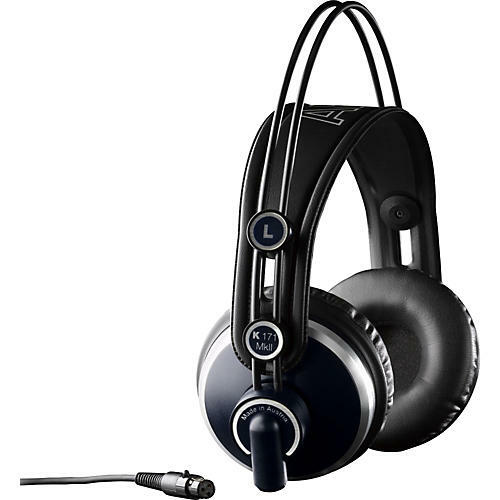 These headphones feature both leatherette and velvet earpads for great fit and maximum comfort. The K171 MKII headphones include a detachable 10' straight cable and a 16' coiled cable. They offer a frequency range from 18Hz to 26kHz, giving you highly accurate monitoring with the added isolation of a closed-back design. If you want efficient, dynamic listening, you'll appreciate the great sound you get from AKG K171 MKII Headphones.